This dynamic neighborhood currently serves as Chicago’s center for nightlife, fine dining and entertainment. Bordered by the Chicago River and Lake Michigan, this pocket was originally the location of the city’s first three taverns, hotel and trading post. Once known as “Smokey Hollow” due to the many factories creating smoke that blocked the sunlight, the fall of the area’s industrial purpose led to its notoriety as Chicago’s red light district. Although many development surrounded the rich east side of the neighborhood and expansion of north Michigan Avenue under the banner of “The Magnificent Mile,” not until the 1970s did the area turn from the somewhat seedy nature. Real estate developer Albert Friedman named the area “River North” to attract potential tenants. 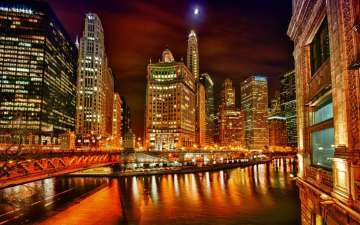 Now River North is still visited and enjoyed for the festive and colorful nightlife providing some type of entertainment for everyone.